.-= Thom´s last blog ..What’s Your Personality Like? and Dumbest Illegal Immigrant =-. CRAP! I set it to the wrong day!!! No wonder..you came first, Thom! …I was trying to log in with my comment.. I did have a scary moment thinking I had the wrong day there! Enjoy your sensational haiku Tuesday! .-= Jade @ No Longer 25´s last blog ..It’s so nice to be in Nice =-. Should I be first up? It doesn’t help my ego. Me trying to beat ShaMoo. Well I could be last! I’ll wait a minute or three. Na! I’ll go for it. took so long to come on…what happened? The 19th didn’t highlight until 12:05am…anyway I’m up and the ones ahead are on the 18th?? Knarf: you’re legitimately the first again this week. What a commitment!!! As for you, ShaMoo, what’s happened? Losing your touch? .-= tilden´s last blog ..Sensational Haiku Wednesday – Ego… =-. .-= Bing (PinkLady)´s last blog ..The Ego (Haikus) =-. 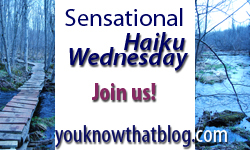 .-= Jessica´s last blog ..Sensational Haiku Wednesday =-. The wind’s in my sails. At others, really, I am not. Others will: it starts with you! Damaged ego with some hurt. Feels good to be me. I like who, and where, I am. Don’t see me as others do. A regular guy . . . . . .
You’re so good for my ego. Very well done, J-B, I love these. there IS always better… You’re totally right! Thanks for hosting another wonderful week! .-= Jillien´s last blog ..Haiku! Yes Sir! =-. .-= stephanie (bad mom)´s last blog ..mania =-. I warned you….but it was the first thing that came to my mind; tease me if you must :) Have a fantastic day, all!! .-= JennyMac´s last blog ..Do not touch that with your bare hands =-. *hugs* to your friend – and you’re so right JM!! I am on hiatus because of a trip home to visit my aging parents. Please accept the above as my weak contribution to this week’s them. .-= Polly´s last blog ..Alphabe-Thursday: The Letter R =-. .-= carma´s last blog ..Now Who’s the Sucker (Hides Head) =-. My son is very itchy. I hope she doesn’t get it. LOL answered you on my blog, Jenn. .-= Broot´s last blog ..Looking for a few “Potted Plants” =-. Hi! You’re the haiku girl!? Cool! I keep meaning to pop over here. I am really bad at haiku’s. I’ve thought about participating in your meme but the talent to do this style of writing is elusive! You have some great links each week, though. .-= Jenny Matlock´s last blog ..Lewis Carroll said… =-.